The rest of Mona’s Saturday. Then yesterday Henry and I did some good decluttering in the livingroom. I got rid of a ton of old outgrown homeschool materials, which cleared off two shelves, and then Henry organized the DVDs on those shelves so they’re not in a horrible useless pile anymore. Yesterday evening we picked up Henry’s friend John and went to the Rockola gig at Tango del Rey, which was great fun as usual! Got home at midnight and went right to bed but then I woke up at 6 this morning for no reason at all, grrrrrr. So I’m going to bake some cookies and then go back to bed. In which Mona finds something to do on her Saturday. Yesterday morning Henry changed his guitar strings and practiced while I sewed a few new shopping bags, and then he and Dan disappeared to play videogames and I poked around at Netflix. We suspended our Greencine account a few days ago so we could try Netflix because they offer quite a lot of things to stream instantly, which is, of course, very tempting. I found a BBC miniseries of Gaudy Night, one of my favorite Dorothy Sayers novels and one which I just finished reading for the fourth time (or so). I was pretty worried about watching it because I have such a clear idea of how Lord Peter and Harriet should look, and if the cast was bad it would be so bothersome, but I also knew the BBC would do a good job with costumes and sets and it would look really authentic, and since I have no idea at all of what Oxford looked like in the 30s, I wanted to at least give it a try. In my opinion, Harriet Walter makes a very good Harriet Vane, and Edward Petherbridge is not a bad Lord Peter. Not quite right, but not terrible. They scrambled the plot but of course they had to compress a 500-page book into just a couple hours of TV, so oh well. They did keep a great many lines verbatim from the book. Anyway I watched about half yesterday and will finish up today when I’m done writing this. Chloe came over in the afternoon and we knit and watched episode 2 of Wonders of the Solar System and did a bit of gardening, and then Bob came over too and we got started talking about 1970s disaster movies and discovered that Netflix had “Earthquake” for streaming, so we watched that all together. It was just dreadful but very entertaining to make fun of. Take off your pantyhose! We hope they will come over tonight to watch Breaking Bad, woohoo! Breaking Bad is a close second after Mad Men for Best Thing on TV. In which Rush hears a Wagner opera and brings something nice home with him. In which Randy goes out to look at French paintings for her very first Saturday adventure and meets a very interesting person. I’m starting a new podcast, “Kayray Reads to You”, in which I will read aloud from some of my very favorite kids’ books, starting off with Elizabeth Enright’s wonderful “The Saturdays”. Or click here to view in iTunes. I prefer reading to editing so, since I am not making audiobooks here, these podcast episodes will be mostly unedited. If the cat starts yowling, well, you’ll hear her yowl! Here’s the first chapter. Enjoy! 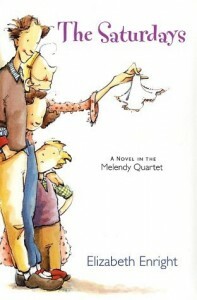 The four Melendy family books, of which this is the first, have recently been reprinted in beautiful hardback editions. I suggest you pick up all four before they go out of print again. Mix all dry ingredients well in a large bowl. Then add sugar, butter, molasses, and water. Mix well. If the dough seems too wet, add a few sprinkles of flour until it is quite stiff. Chill the dough, then roll out on a floured board and cut into shapes. Arrange cookies on tinfoil, place foil on a cookie sheet, and bake at 400 degrees for 8 minutes–do not overbake!! Cookies will still be soft when they come out of the oven, but will harden as they cool. You can fill a new piece of foil with cookies while the first batch bakes. Preheat oven to 350 degrees. Cream together the butter and sugar. Beat in egg, water, and vanilla. Combine dry ingredients in a separate bowl, then add to batter. Add chips or raisins. Drop by spoonfuls onto tinfoil, flattening slightly. Bake 12 minutes. Cookies will be soft when removed from the oven but will firm up when they cool. Prepare a second batch while the first batch bakes. Enjoy! 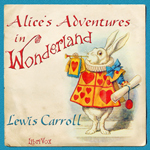 While I was recording Alice in Wonderland, I got to thinking that although I know a couple of the original poems (e.g. ‘Tis the Voice of the Sluggard) that the author parodied, I didn’t know them all. And that most kids today probably don’t know any other than Twinkle Twinkle (and maybe not even that one). So I started searching around for information on the original poems and bumped into a great article in a periodical called The Bookman, Vol. 18, September 1903. And here’s my little recording; it’s only about 14 minutes long. It will feed you one sentence at a time, with the previous and next sentences for context. There are a few very simple sentences that I can translate myself, which is fun, and my friend Elli, who is a native German speaker and also speaks flawless English, will help smooth everything out. To prevent random strangers from bumping into the project and editing rather than translating it, I’ve made it visible only to my contacts. So if you’d like to help, please make an account at Bite-Size Edits and then ask it to make me (username: kayray) your contact, and I’ll OK you right away. Sorry, forgot to post this on Monday! I finished the Hap Blanket for pthree’s baby a couple days ago and blocked it. Yesterday I took photos, and today I will ship it off. You can read all about it on the ravelry page, even if you don’t have a ravelry log-in!! It turned out about 3′ square, so just right for a receiving blanket. And very soft and cuddly. Yesterday I listened to the Fresh Air interview with Wes Anderson about Fantastic Mister Fox. I hadn’t wanted to see it because I love the book, you know, and most of the time kids’ movies that are based on books are a complete disaster. But it sounded like Wes really loved the book, so it seemed possible that he hadn’t wrecked it, and also the information about how they created the movie made me want to see it. So Dan and Henry and I watched it in the afternoon and we all really enjoyed it! Yes, liberties were taken, but they expanded and decorated the original story than altering it beyond recognition. The puppets (or whatever they’re called) were remarkably expressive; their body language was beautiful to see. The voice acting was fantastic. The miniatures were marvelous. And there was none of the horrible X-TREME-ness that I’ve come to dread in kids’ movies. It was charming and even touching in places but without gloopy sentimentality, and the humor was often subtle and sharp. I laughed aloud quite a lot.